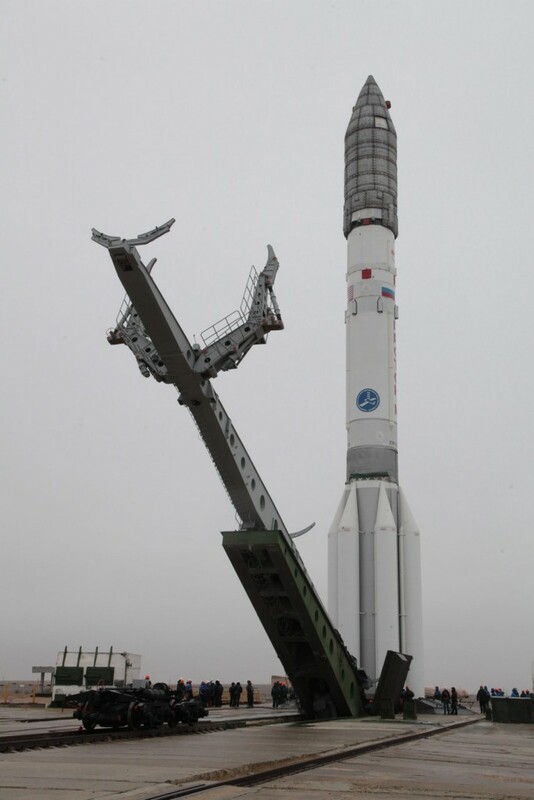 Russia’s Proton-M rocket is set to open a busy year of launches from Russian Cosmodromes on Friday, lifting the Eutelsat 9B communications satellite to Geostationary Transfer Orbit in a mission lasting nine hours and 12 minutes. 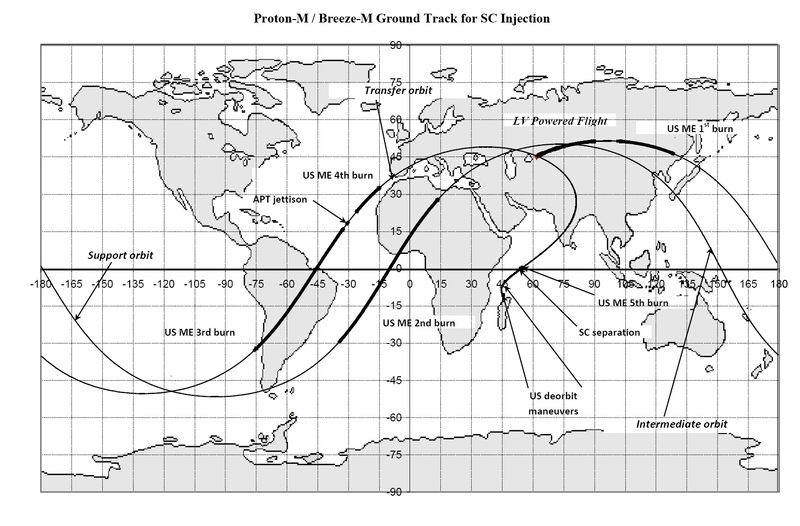 Proton’s nighttime liftoff is set for 22:20 UTC as the venerable booster departs Baikonur on a standard flight profile taking it just under ten minutes to send the Briz-M upper stage on its way for a five-burn mission, methodically raising its orbit to drop Eutelsat 9B off in a highly elliptical transfer orbit. In 2016, Russia again sets out for over 30 space launches from three Cosmodromes, introducing the new Vostochny launch base in Russia’s far east. As the heavy-lifter in Russia’s launch vehicle fleet, Proton is currently showing up to eight flights on its manifest in an even split between government-contracted missions and commercial flights handled by International Launch Services. Proton’s year will be highlighted by the launch of the ExoMars 2016 mission currently set for March 14 to send the Trace Gas Orbiter and Schiaparelli lander on their way to the Red Planet. 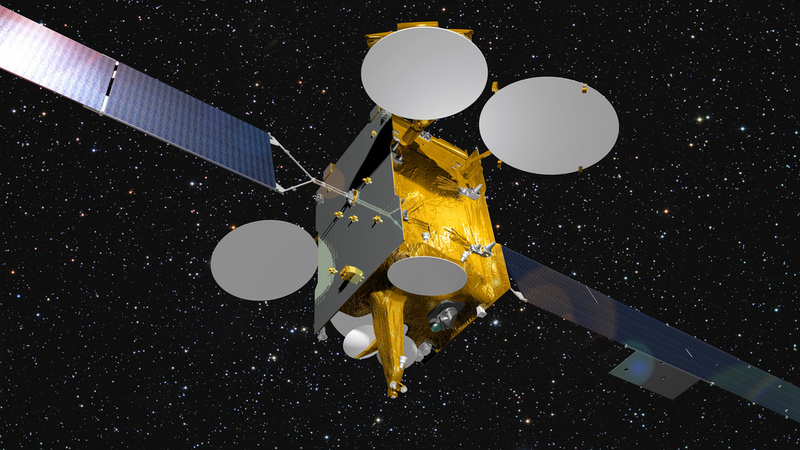 Kicking off its 2016 campaign with Eutelsat 9B, Proton will get one final test run before reaching for Mars. Eutelsat 9B arrived at the Baikonur Cosmodrome back in November and was prepared for liftoff in December when it was loaded with propellants and completed final testing ahead of the integration with the Briz-M and payload fairing. Proton-M was assembled at the Launcher Integration Facility to await the arrival of its payload to complete the lengthy integration process. The Eutelsat 9B satellite, built by Airbus Defence and Space based on the company’s Eurostar-3000 platform, has a launch mass of 5,175 Kilograms and hosts an all Ku-Band communications payload plus the first communications terminal for the European Data Relay Satellite System EDRS operated by the European Space Agency. EDRS will establish a high-speed data highway between Earth and satellites in Low Earth Orbit, leveraging the data rates achieved with laser communications for the downlink of vast volumes of satellite imagery and other data in near real-time. The system will consist of at least two nodes in Geostationary Orbit capable of locking onto optical signals sent from satellites in Low Earth Orbit and converting the modulated laser beam back into radio signals then sent to ground stations across Europe for fast distribution to data users. The advantage of communications terminals in Geostationary Orbit is the ability to cover a large portion of a satellite’s orbit compared to the short communication sessions possible when only relying on ground stations. EDRS will be used by some of Europe’s Sentinel Earth Observation satellites to send radar or optical imagery to the ground in near real-time. 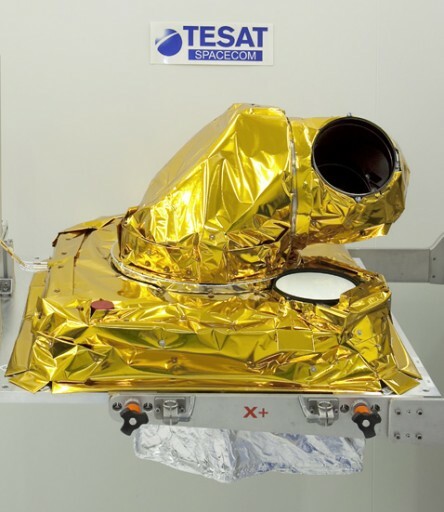 Sentinel-1 and 2 have already demonstrated laser communications with a prototype EDRS terminal installed on the AlphaSat spacecraft launched in 2013. 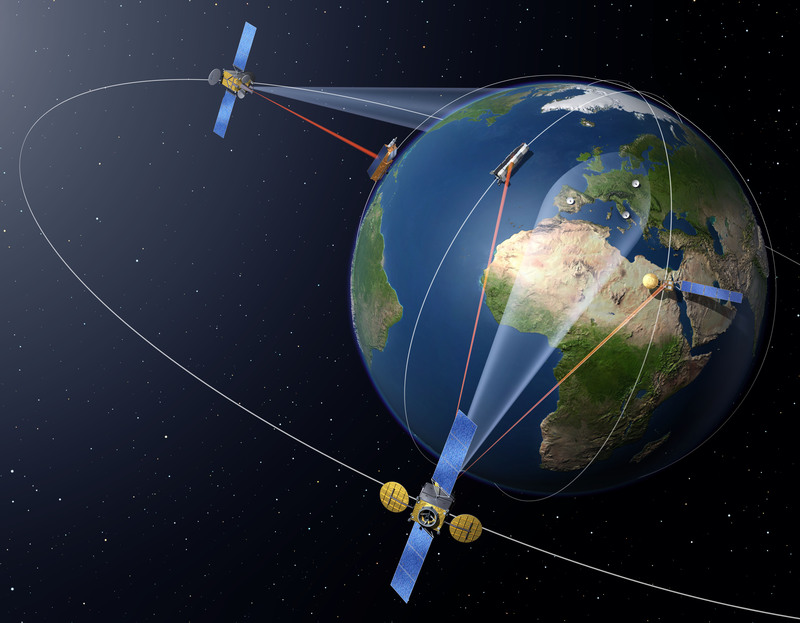 The Sentinel satellites will not be the only user of EDRS as ESA has firm plans to establish an operational laser communications system for data relay from the Columbus module of the International Space Station, starting in 2018. Furthermore, EDRS could be used by airplanes and unmanned drones for fast data exchange. The development and initial deployment of the EDRS architecture costs about 500 million Euros, including development cost, two GEO terminals – one as a hosted payload and one as the primary spacecraft payload, and four ground stations and data processing centers in Europe. EDRS services are available to ESA programs, but will also be offered on the commercial market by Airbus Defence and Space. Once operational, EDRS will be able to support a total data throughput of 50 Terabytes per day, representing an immense increase in space-to-ground data return. The major goal of EDRS is to deliver satellite data to users as fast as possible since data latency can be an issue for many operational applications of satellite data for example in the maritime sector where monitoring of ice flows is significantly enhanced through real time data as opposed to imagery taken days earlier. The EDRS laser link will achieve data rates up to 1.8Gbit/s, converted aboard the GEO satellite for downlink in Ka-Band. EDRS also provides a command uplink capability to satellites, allowing Mission Controllers to deliver instructions to spacecraft for observations on short notice, further enhancing the flexibility of Earth observation missions. EDRS-A installed on the Eutelsat 9B satellite will cover Europe, Africa, the Middle East, the Atlantic Region and portions of the Americas. The EDRS-C satellite will host the EDRS terminal as its primary payload and enter a spot east of EDRS-A to cover Asia and the Indian Ocean. A third EDRS node is planned to launch before 2020 if funding can be secured in order to expand the system to global coverage. 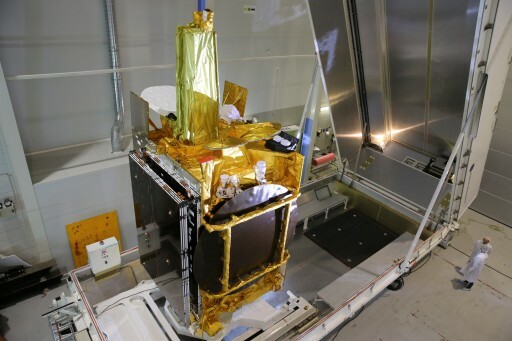 The primary payload of Eutelsat 9B is comprised of 66 Ku-Band transponders connected to a broad European widebeam and four regional beams covering European countries for the distribution of hundreds of TV channels. Eutelsat 9B had a rather long road to liftoff, initially set for a first-half 2015 launch that had to be pushed due to Proton’s grounding after the May 2015 failure. A two-month delay to the ExoMars mission freed up a spot in January, gladly accepted by Eutelsat to get the satellite into orbit. 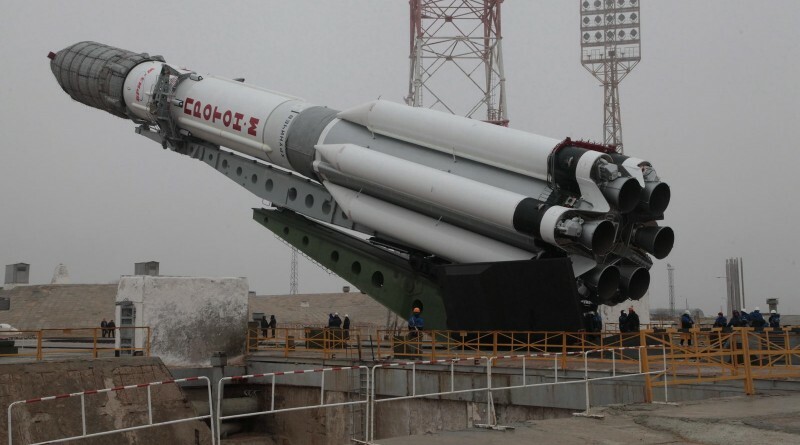 A two-day launch delay had to be called last week due to weather-related logistical issues in the shipment of retrorockets needed for the separation of Proton’s stages. 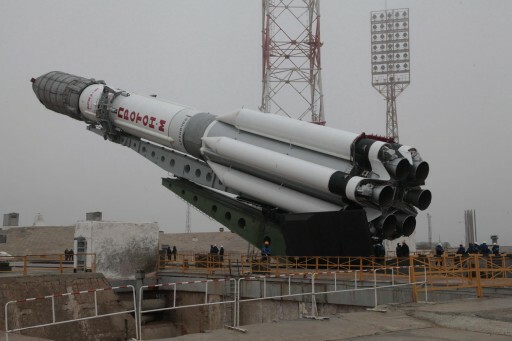 Proton-M was moved to the launch pad at Site 200/39 on Tuesday after spending two days at the Briz-M fueling station where the upper stage received its load of hypergolic propellants. 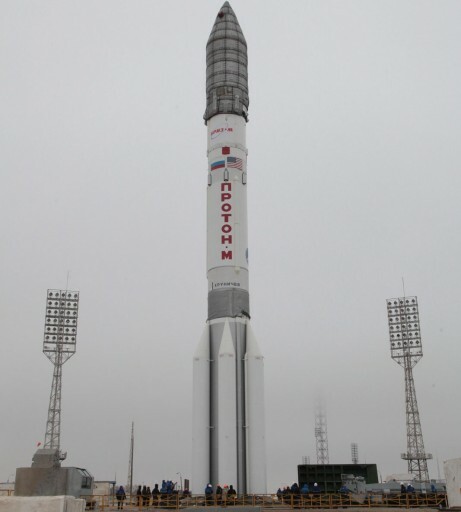 Placed in its vertical launch position, the 58-meter Proton-M entered a detailed testing campaign to set up for the initiation of the countdown on Friday. Proton-M countdown operations kick off 11.5 hours ahead of the planned 22:20:09 UTC launch time with the activation of the Briz-M upper stage for checkouts and software load. Proton-M is powered up seven hours ahead of launch for final setup steps ahead of propellant loading. The Russian State Commission approves the rocket for tanking, starting at L-6 hours to fill the three stages with 622,000 Kilograms of hypergolic propellants. The Briz-M upper stage received its propellant load, 19,800kg of hypergolics, before rollout. After the conclusion of the fourth burn, Briz-M will coast for over five hours to be able to climb all the way up to the apogee of the orbit for the final burn of the mission that serves as a perigee-raising maneuver and a plane-change, reducing the inclination of the orbit. Spacecraft Separation is expected around nine hours and 12 minutes after launch.